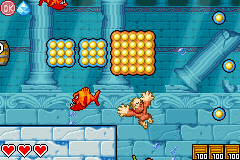 This article is about World 4 from DK: King of Swing. For the Sammer Guy of the same name, see List of Sammer Guys#Ice World. 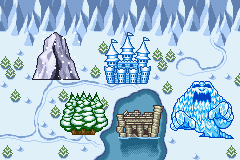 For World 6 from Super Mario Bros. 3, see Ice Land. 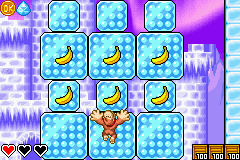 Ice World is the fourth world Donkey Kong (or Diddy Kong in Diddy mode) ventures through in the game, DK: King of Swing. It is found after the Kong completes the Aqua World area. Once the first four levels in this world are completed, the primate can travel to the world's boss level to fight Sassy Squatch, a giant yeti. 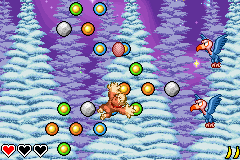 As its name suggests, Ice World is full of snow and ice-themed levels, along with a level that is set in underwater ruins. The world is also home to a forest full of Neckies and a tall mountain with many moving peg boards on it. Near the end of this world, the Kong travels to a level with a castle that consists of many icy peg boards that he can slip on. Other obstacles in this world include tires, crates, barrels, mines, Rotatable Barrels, Barrel Cannons, rocks, wheels that can be spun to move it along a bar, pegs that rise upwards out of gaps, spikes, switches, levers, and other objects. Neckies are not the only enemies located in the Ice World: there are also Kritters, Shuris, and Lockjaws. Rotatable Barrels must be used to advance in the initial part of the stage. Beyond that, Raging Ravine introduces the bomb items, which can be picked up like stones and thrown at chunks of ice or ? Barrels to destroy them. A Kritter enemy is encountered who will throw bombs at a platform to its left. 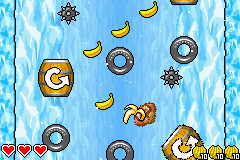 The first stage of Ice World has Donkey Kong encountering Mini-Necky enemies and utilizing Rotatable Barrels and ? Barrels. The last area of the level has DK climb up a long vertical stretch with bouncy tires and barrel cannons as obstacles. Ice Castle has Donkey Kong climbing on frozen peg boards to get upward at the start. He will have to turn valves, using levers, and throwing stones at enemies throughout the stage. Donkey Kong explores the remains of a derelict sunken castle. Levers are used throughout the stage to open pathways and progress. Shuri and Lockjaw are found aplenty while in the area. The battle with Sassy Squatch calls for Donkey Kong to quickly climb up the area, grab a bomb, and toss it into the monster's mouth. 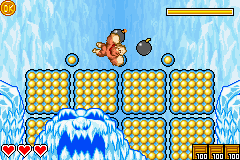 Upon swallowing a bomb, it will spit up an icy attack and make pegs that DK can climb up to proceed upward. This page was last edited on March 7, 2019, at 13:09.